We are pleased to announce that we are now distributing our 2017 comprehensive catalogue. The catalogue showcases our extensive range of products and offerings. 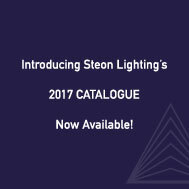 This catalogue is the first edition under our new company name ‘Steon Lighting’. On 1st February 2017 we underwent a re-brand and changed the trading name of the company from Lamps & Lighting to Steon Lighting. The catalogue includes products from our three brands: Steon, Luxace and Historix. Steon is our technical brand from which we take our namesake, synonymous with quality, flexibility and reliability. Luxace is our contemporary brand reserved for luminaires of exquisite design which lend themselves to contract feature lighting. Our latest brand, Historix, is our heritage brand combining the latest lighting technologies with timeless classic designs. Complementing our catalogue release, we have given our website a facelift and all of our latest datasheets and photometrics can be downloaded. We are currently working on designing a Historix page, which will include all of our interior and exterior Historix luminaires.